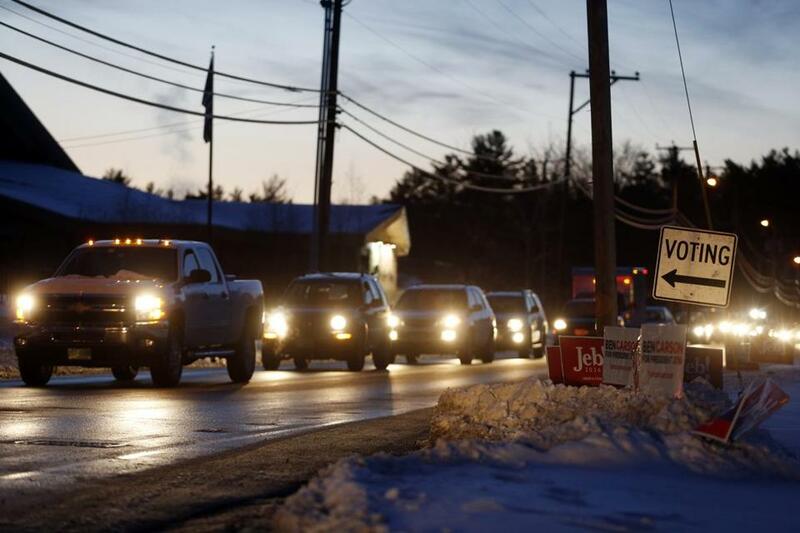 Voters waited in a miles-long line of traffic to vote in the N.H. primary in Merrimack. MERRIMACK, N.H. — What happens when an entire town of 19,000 voters tries to funnel into one polling place? Long lines of snarled traffic, with cars inching toward the polls at less than 1 mile an hour. And that’s with a new system of temporary traffic changes that was supposed to improve flow to the polls but clearly backfired, Merrimack town officials acknowledged. The back-up was so long that town officials extended voting hours after the polls were scheduled to close Tuesday evening. Richard Josephson tried to approach the polls this morning, saw the line, gave up, and tried again around 3:30 — only to wait 90 minutes to move less than a mile from Daniel Webster Highway and Baboosic Lake Road to the town’s polling location at Merrimack High School. “I would imagine there’s quite a few people that turned around and left, but I’m too damn stubborn,” said Josephson, an 80-year-old retired electrical engineer and Republican voter, as he left the high school. Globe reporters are providing live updates during the 2016 race for president. Christensen said the rapidly growing town roughly 50 miles northwest of Boston had half as many voters and one polling place when she became moderator in the late 1980s. She added two more, at churches on the north and south ends of Merrimack. But neither had the parking lot or floor space to accommodate more than a few dozen voters at any one moment, even as they multiplied the cost of running an election, so the town reverted to one polling place. That works well enough for town and state elections, but the 2008 presidential primaries — competitive for both parties, with no incumbent — drew a record 11,000-plus voters, and strained the capacity of the local roads that feed the high school, which is situated roughly halfway between Webster Highway (Route 3) and the Everett Turnpike. Expecting another big crowd this cycle, the police chief decided to make the approach and exit streets to the school one-way, to create a loop, Christensen said. The experiment backfired, but they agreed it would make it worse to try to change it again on the fly after advertising the changes, she said. “Everybody’s been [complaining] about the traffic to me, no question,” Christensen said. After sitting in the long line — or abandoning their car partway and walking to the school in the cold — few voters took solace in the way they breezed through the school once they finally arrived, with a full complement of check-in workers and roughly 300 voting booths. “It is what it is, and we try to make the best of it and accommodate voters,” said Christensen, who said turnout was not on track to exceed 2008 in Merrimack, though she did not know if the numbers were off because of the traffic delays, because some of the customary early morning voters were clearing snow instead and would come later, or for other reasons. “I don’t want to turn anyone out,” she said. On the way out of the gym, Merrimack voter Judy Hall said — like Richard Josephson — that she had tried twice to reach the polls, abandoning her first attempt mid-morning but sticking it out after work. “This was awful regarding the traffic pattern, but we’re all here because we wanted to vote,” said Hall, a 57-year-old senior recruiter for an international food-services company. Worried especially about seniors, Hall said she thought the town should run a shuttle in November for the general election from Webster Highway — just like it did “when the [Merrimack] Outlets opened and for Ribfest,” an annual road race and barbecue festival. Despite the long wait, she was in good spirits.